Perhaps you have heard people saying this quote (and its variations) in any theme parks you have visited: "No way I'm riding that one. I'm too scared." But here's a question that I would like to ask back: What does it mean exactly by "scared?" Moreover, what makes a coaster scary? I'm sure that a majority of us are unable to answer these questions. They're simple and straightforward, yet carry undeniably complex responses that require the questionees to reflect upon themselves and delve deep into their psychological conditions. The truth is that most people do not know exactly what scare them the most. Is it the disgust that scares them? Is it because they have certain phobias that shut down their system entirely when faced with their phobias? Who knows. This wooden roller coaster is located at the roller coaster capital of the world, Cedar Point. The name of the coaster is simple and consists of only two words: MEAN and STREAK. The direct impression of this coaster should be this: this coaster will streak you meanly, meaning with no mercy. Oh, I mean, every single theme park in this world would like to dramatize the name of their roller coasters, right? 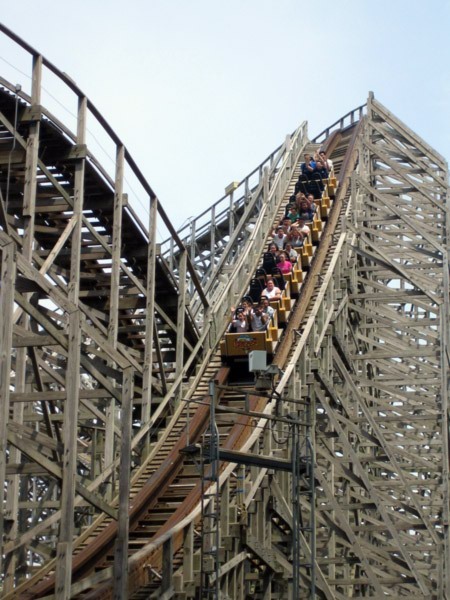 Trust me, when Cedar Point named this coaster "Mean Streak," they truly mean it. Mean Streak's violent first drop and the rest of its layout. 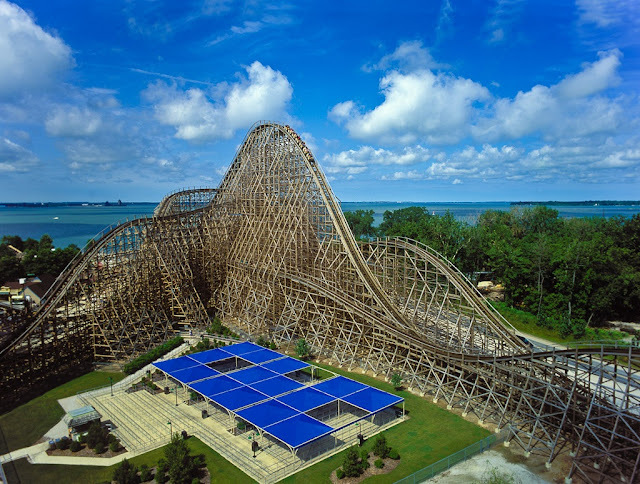 Photo taken from Unofficial Cedar Point Wiki. You will shake up and down so violently that you can feel your heart and guts being thrown around and crying, "Please stop!" After the first drop, you would have already begged, "Please, make this ride stop!" These riders are ready for their deaths... Photo taken from Theme Park Review. Mean Streak is no mere roller coaster. It's a beast, a devil, a roller coaster that seduces you to ride with its beauty but then assault you with its apparent roughness. Unless you are in fully healthy condition, just skip this roller coaster when you are visiting the park. People seems to agree that the taller // faster // longer a roller coaster is, the scarier it is. However, this is not true. For example, look at Superman: Escape from Krypton at Six Flags Magic Mountain, which -- despite reaching a speed of 100 mph and a height of 415 feet -- is not a scary coaster at all simply because it is just launch backward, go up, weightlessness, go down, brakes, and then stop. Thirty seconds and it's done. 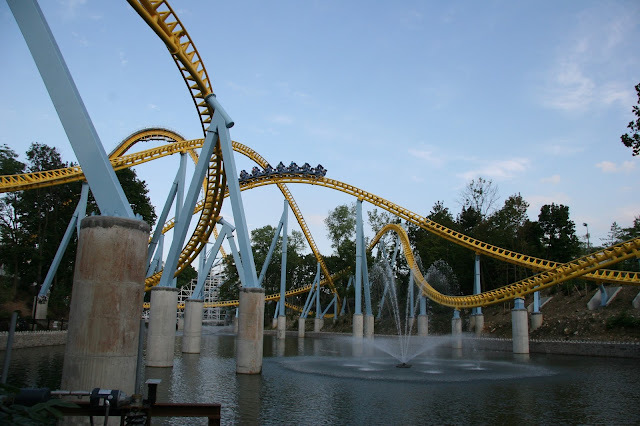 In Spring 2012, a theme park well-known for its nearby chocolate factory, Hersheypark, opened its prototype "Wing Coaster," created by Intamin, called Skyrush. Reaching a top height of 213 feet and a top speed of 75 mph, a lot of roller coaster fanatics immediately thought, "Oh, what a cute little Intamin roller coaster. I guess it is good enough for Hersheypark standard..."
Skyrush going through one of its extreme turns. Photo taken from Wikipedia. 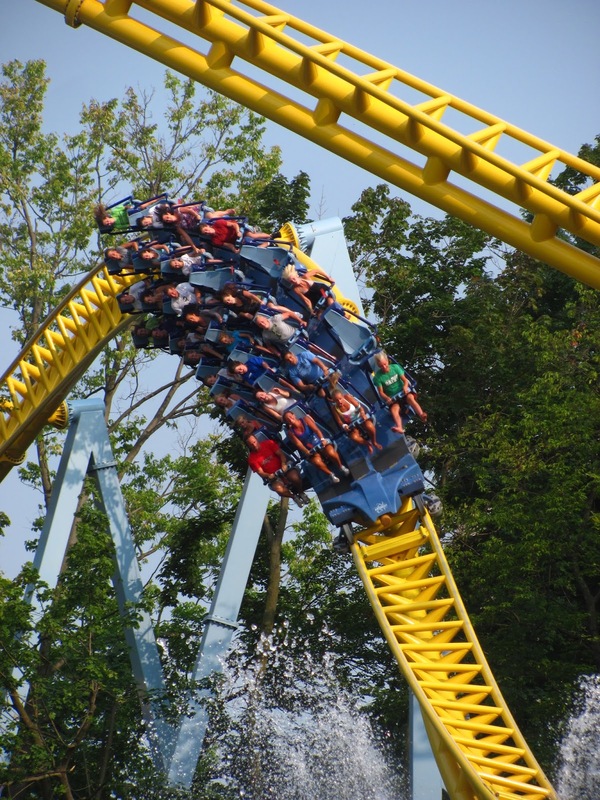 Skyrush is a roller coaster that proves that size TRULY doesn't matter. Skyrush is a roller coaster that's all about how it uses what it has. Skyrush slaps us in the face REAL HARD to not judge a book by its cover. Skyrush is the most extreme -- and possibly scariest -- steel coaster in the U.S., and even the world. What exactly makes Skyrush so extreme and so scary for me? THE LIFT HILL. You know that moment when people start to reflect on their lives as the train ascends the lift hill, being pulled up and up slowly by the chain lift? Too bad, Skyrush doesn't have this. Instead, Skyrush literally jets your way up to the 200-foot hill at a speed of 20 mph (that is FREAKING fast! ), leaving you no time to reflect on how you are already pooping your pants out. THE FIRST DROP. The first drop is not too high, per say. However, when combined with an 85-degree angle of descent, that actually becomes pretty terrifying. Not only that, the drop is followed immediately by a sharp right upward turn, creating a huge assault of positive vertical G's and lateral G's. On my first ride, I was so not ready that my body was literally thrown to the left (literally outside the seat) like a contortionist! THE AIRTIME HILLS. The airtime hills on this coaster is perhaps the most extreme in the world. Not even El Toro at Six Flags Great Adventure can surpass the horrifying feeling of being thrown out of your seats. According to a source, the airtime hills Skyrush record eye-popping -2.0 G's. What does this exactly mean, it means at the top of these hills, your body weight equals "your body weight" multiplied by "-2." This is one roller coaster that will throw you out of the seats completely (don't worry... the restrains will hold you down). Skyrush's terrifying airtime hills. Photo taken from Ebernet. THE RESTRAINTS. I'm not usually a person that is terrified particularly by the restraints of a roller coaster. But Skyrush's restraints are exception. Ladies and gentlemen, I would like to present to you the world's most painful restraints. 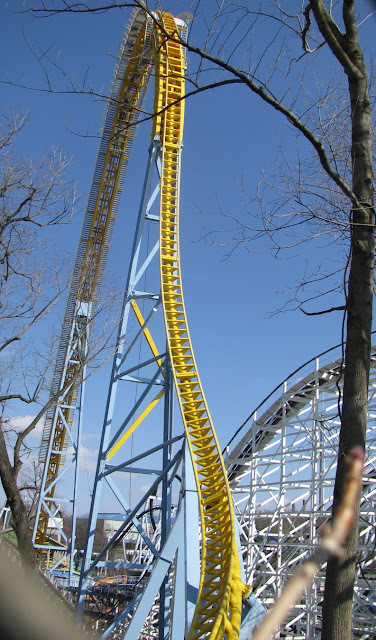 Skyrush's restraints would hold onto your thighs so tightly and hard that you could potentially get bruises around your knees if you ride this roller coaster. The restraints would unleash its full power when riders go through the airtime hills (at -2.0 G's, only the restraints hold you down). Skyrush is a roller coaster that, despite its small size, should not be underestimated by even the most experienced roller coaster goers. This is not a roller coaster that can casually be enjoyed. This is not a roller coaster for those who say, "Oh, I just want to try it once... I mean, you'll never know if you never try." This is a roller coaster where riders have to actively ride, bracing for each turn and airtime hill, positioning their backs and heads against the seats at all time. This is a roller coaster where lifting your hands up is definitely not recommended, as that equals to you losing control of your body. This is a roller coaster that will assault you with G-forces, pain, and of course... rush! I think that's enough from me for now. How about you? What roller coasters have terrified you to the point of no return?